Municipality of Herzliyya is situated on the SW Sharon area, just north of Tel-Aviv. It was established in 1924 and named after Beyamin Ze'ev (a.k.a. Theodor) Herzl. It has 100,000 inh. Its official symbol includes Herzl's seven stars, two spikes, sail boat (situated by the shore) and cogwheel (industry). I did not get too much information from the city spokesman however - I already knew the unofficial flag but lacked a good emblem for drawing it. The unofficial flag is the emblem on a national flag (without Magen David). I scanned the emblem from the desk flag (vertical variant). The municipal emblem was published in the official gazette (Rashumot), YP 1846, 17 August 1972. 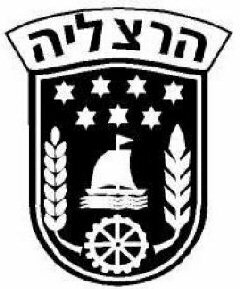 It replaced the previous and quite similar emblem of the Local Council Herzliyya, published YP 631, 30 October 1958. I was at Herzliyya today and I noticed that the stars on the flag are in gold as in Herzl's vision of flag. Cogwheel (in the bottom) - symbol of industry and handycrafts." Herzliyya was established on 23 November 1924 and became a municipality on 11 April 1960.